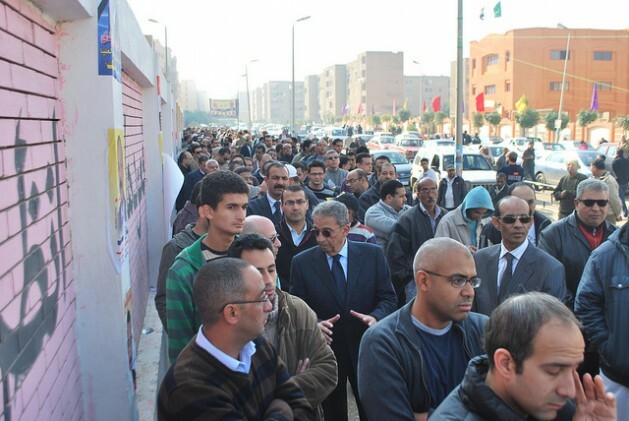 Queuing up to vote in Cairo. Credit: Khaled Moussa al-Omrani/IPS. These findings are the result of a series of face-to-face polls conducted by Zogby Research Services on a commission from the Sir Bani Yas Forum in the United Arab Emirates (UAE) and released at a Middle East Institute-sponsored event on Wednesday. In September, ZRS interviewed a total of 7,400 adults across eight countries—Egypt, Iran, Iraq, Jordan, Lebanon, Saudi Arabia, Turkey, and the UAE—on a broad range of topics, including the ongoing conflicts in Iraq, Libya, Syria, and Yemen; the Israel-Palestine situation; the Iranian nuclear deal; and the threat of religious extremism. Respondents in Iran and Iraq were also asked a separate series of questions about internal affairs in those countries. the two most commonly cited factors in the development of religious extremism were “corrupt governments” and “extremist and/or incorrect religious ideas"
With respect to Israel-Palestine, the poll found that people in five of the six surveyed Arab nations are less likely to support a comprehensive Arab-Israeli peace deal now than they were back in 2009, when Zogby International’s “Six-Nation Arab Opinion Poll” asked a similar question of respondents in those five countries. In Egypt, which has seen the sharpest decline in support for a peace deal, almost two-thirds of respondents said that they would oppose a peace deal “even if the Israelis agree to return all of the territories and agree to resolve the refugee issue,” compared with only 8% who answered similarly in the 2009 survey. This represents a potential risk for Egyptian President Abdel Fattah el-Sisi, who has worked to improve Egyptian-Israeli relations despite the apparent feelings of most of the Egyptian public. Similar, albeit smaller, shifts were seen in Jordan (where 24% oppose a deal today, compared with 13% in 2009), Lebanon (30% vs. 18%), Saudi Arabia (36% vs. 18%), and the UAE (19% vs. 8%). Iraq was not part of the 2009 survey, but 59% of respondents in this survey said that they would also oppose a comprehensive peace deal with Israel. Inside Iran, on the other hand, 80% of respondents said that they “supported” the deal, but 68% agreed that it was a “bad idea” for the Iranian government to accept limits on its nuclear program—or, as ZRS managing director John Zogby put it at the poll’s roll-out event, “they’re for the deal, but they don’t like it.” On the question of whether Iran should have nuclear weapons, roughly 68% of Iranians said that it should, either because Iran “is a major nation” or because “as long as other countries have nuclear weapons, we need them also.” However, the percentage of Iranians saying that their country should have nuclear weapons “because it is a major nation” declined from 49% in 2014 to only 20% this year, and the percentage of Iranians who said that “nuclear weapons are always wrong and so no country, including my own, should have them” rose from 14% last year to 32% this year. Still, it was in the area of extremism and its causes where the poll generated its most interesting findings. When asked to rate eight factors on a 1-5 scale (where 1 means “very important factor”) in terms of their importance as a driver of religious extremism, respondents in all eight countries gave “anger at the U.S.” the fewest number of ones and twos, although that factor was still rated as important by a majority of respondents in Egypt, Saudi Arabia, the UAE, and Turkey. Zogby argued that this was a sign that Barack Obama’s attempt to leave a “softer U.S. footprint in the region pays off.” However, when asked whether the United States is playing a positive or negative role in combating extremist sectarian violence, large majorities in each country said that the U.S. was playing a negative role. Instead, the two most commonly cited factors in the development of religious extremism were “corrupt governments” and “extremist and/or incorrect religious ideas.” Other commonly cited factors, like “lack of education,” “poverty,” and “youth alienation” also speak to a consistent sense that extremism is an internal problem stemming from poor governance. Majorities in each of the eight countries except Iran agreed that “countering the messages and ideas promoted by recruiters for extremist groups” and “changing the political and social realities that cause young people to be attracted to extremist ideals” were “most important” in terms of defeating violent extremist groups like the Islamic State. Within Iraq, majorities from all three of the country’s major ethno-religious groups (Sunni Arabs, Shi’a Arabs, and Kurds) agreed that “forming a more inclusive, representative government” is the best way to resolve the conflict there, but even larger majorities from each group said that they were “not confident” that such a government will be formed within the next five years.